Most people know to add oil to the top of their engines, and that oil drains out the bottom. Because I have worked in auto repair for 35 years, it is no mystery to me what happens between filling and changing the oil. But I am surprised at the number of people who do not have a true picture of the path the oil travels while it makes its way around inside of the engine. To answer that question, I would use the Socratic method and ask a few questions of my own: What kind of car do you drive? What driving conditions do you encounter most? Where do you live? How old is your car? The answer to these questions will determine the best oil for your vehicle, and how well it protects and lubricates your engine while it goes around and around inside. Where does the oil travel, in what order, and what exactly does it do inside your engine? First, the oil you pour in the top of the engine goes through many paths eventually arriving in the bottom oil pan, often called the sump, where the drain plug is located. The oil goes through several different paths returning to the bottom - but only one path, under pressure, to do its job. Figure 1 shows a tube with a loose-weave metal screen at the bottom of the pan. The screen is attached to a pickup tube, which leads directly to the oil pump. The tube and screen are submerged in the oil at a depth of about four inches. The screen prevents large pieces of trash, usually lrger than 1/32nd of an inch, from entering the oil pump. Many people do not realize that most oil pumps are just a set of special gears, which take in the oil under low pressure and squeeze the oil to a high pressure, where it then passes through a chamber with a spring-loaded valve. The valve allows the oil to leave only under a specified pressure, usually between 1 and 60 lbs./in.2 Any pressure higher than this will be vented back to the sump because high oil pressure can damage bearings. From the pump, it goes to the outside of the oil filter, and there it is forced through the filter media to the center, where it exits into the oil galleries inside the engine. The oil filter also has a bypass valve to keep the pressure from dropping too low if the filter becomes clogged. The first and most important job of motor oil is to lubricate the rotating components of an engine, and it must be under a good pressure to do its job. Oil is forced into the space between the bearings making contact with the crankshaft journals and the journals. The bearings are simple metal sleeves encircling the rotating components of the engine. The block has main bearings on the crankshaft, and connecting rods bearings are on the crank throws. This thin space, usually one-thousandth of an inch on newer engines, holds a thin film of oil between the bearings and the moving surfaces on the crankshaft. Under pressure and within the correct operating temperature, the oil protects and prolongs the life of the machined parts. Metal should never touch other metallic surfaces while it is moving. It is important to note that some of the oil is forced out of the sides of the bearings and drips back into the sump. If the clearance is too much, say 0.004 of an inch or better, pressure starts falling in the upper end of the engine. A flickering oil light or a slight tapping sound in the rocker arm area on the topside of the motor is a good indication that not enough oil under pressure is reaching the top end of the engine. Looking aside for a minute, I would like to see an automotive engine with roller or needle bearings replace the far cheaper and sufficiently long-lived sleeve bearings. I know it would cost a fortune to build such a motor, but it would last forever. Many larger engines have needle/roller bearings. Generally they turn at lower rpm (speed) than gasoline car motors. RPM is not the limiting factor. I have flown model airplanes for 40 years and many of my highest-revving engines (25,000+ rpm compared to 2,500 rpm in an automobile engine) are equipped with roller bearings for lower friction and higher rpm. A roller/needle bearing-equipped auto engine would have higher power and longer life, but at what production cost? 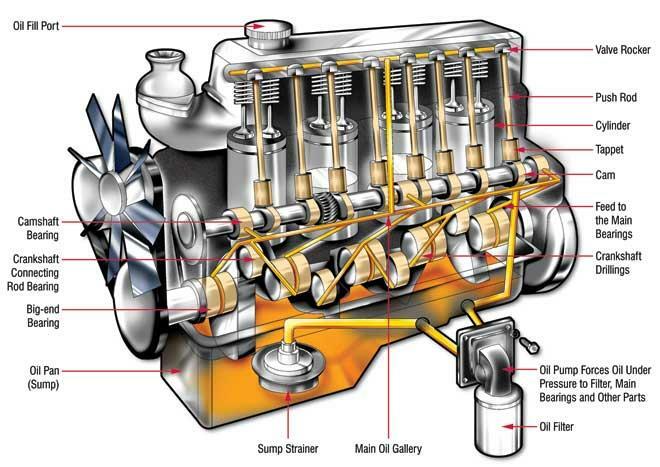 Most of the oil lubricates the crankshaft area, while the remainder lubricates the camshaft and rocker arms. If your car has pushrods rather than an overhead camshaft, then oil is forced under pressure into the valve lifters. These lifters also pump oil up through the hollow push rods to lubricate the rocker arm area. If your car has an overhead cam, the oil is carried to the cam and is spilled onto the contact points between the cam and valve stems. After lubricating the camshaft and the related components, the oil flows by gravity back down channels in the head and motor block to the sump, ready to begin another journey. In many of the connecting rod designs, there is a small hole that sprays oil onto the cylinder to lubricate the piston ring contact area of that cylinder. Special rings on the bottom of the piston ring set wipe off excess oil and return it to the sump. Regarding oil consumption, it may likely be necessary for you to add a quart of oil to your engine, at regular 3,000-mile intervals. Most of the newer cars will not consume any oil the first few oil changes. Afterward, oil consumption will gradually increase with age. What is too much consumption? If I had to pick an ideal figure, I would say one quart every 5,000 miles. The best car I ever owned let me know it was time for a change by being a quart low regularly at 4,000 miles. I saved adding a quart and changed the whole sump and the filter. Why do I prefer a little oil consumption? In my opinion as a lifelong auto mechanic, those engines that consumed a little oil by allowing it to pass around the rings, kept wear on the upper cylinder and rings to a minimum. Years ago, we used to add top oil to our gasoline for that same purpose. External oil leaks can be messy, a potential fire hazard, and just plain ugly. Why do used car dealers go to great effort to clean a motor before exhibiting it for sale? Our general impression of the engine is formed around how clean it is and how smooth it runs. Most people open the hood before starting it up. If the salesman starts it up before he opens the hood, he is depending on the first impression of a well-running motor negating what will likely be a dirty motor under the hood. If the dealer has failed to clean the motor, it most likely has a bad oil leak he doesn’t want to fix. If he opens the hood and it runs well, look where the car is parked as you test drive it. Oil on the lot will give you a bargaining tool. Many types of leaks can be fixed for less than $100. 1. What is normal consumption? And why did his car not burn any oil for 30,000 miles? 2. Why does the oil consumption occur during highway miles and not during stop-and-go driving? 3. What caused the oil usage pattern to change after having driven the car this long (30,000 miles)? Cars consume more and more oil with age. Normal consumption is a subjective call; I made mine at one quart per 5,000 miles. I also stated that many cars will not burn oil at all for a while - once again, a variable. The fact that his consumption is brought on by highway conditions leads me to suspect an internal oil leak around the valve stems seals or some failure in the PCV system. The fact that the pattern changed abruptly would reinforce my belief that a failure (either an undetected leak or abnormal consumption) is the culprit. I have one car with more than 175,000 miles and it consumes oil at the rate I like: one quart every 4,000 miles. My newer car with only 70,000 miles also consumes one quart per 4,000 miles, and it has always done that. Oil leaks are difficult to detect in a car. The engines are tightly enclosed and difficult to see from any angle. Add a list of accessories bolted to the block and visibility approaches impossibility. However, in the next issue of Machinery Lubrication, I am going to introduce some of the latest leak-finding techniques. Phosphorescence, polymer acrylic, ultraviolet, smoke, and maybe even mirrors will be discussed next issue.